Portland isn’t a place that is really known for its Italian restaurants, but there are a handful of them, and the newest is Roustabout. What I like about the Italian scene in this great city is that every restaurant of the type has their own thing going. Each has little resemblance to the other and the menus are all quite unique. Roustabout is no exception to this pattern which got me pretty fired up about trying the Washington St. location next to Maine Mead Works. Upon walking in, I immediately noticed that the restaurant was very aesthetically pleasing as are the majority of new restaurants in the area. It was also very busy which wasn’t much of a surprise considering they had only opened a couple of weeks before. We had reservations and were seated and immediately began looking at the menus. I wasn’t drinking that evening, but there was a solid selection of cocktails, beer and wine available. My wife quickly decided on a Sauvignon from France and we started our scouring of the food options. With headings of appetizers, pastas, entrees, sides, and desserts, the menu seemed pretty basic and wasn’t overly large. There were a few of the standard items within, though I was focused on something a little more signature. I considered a number of dishes, but had a bit of trouble deciding if I wanted fish, chicken, pork, or something else altogether. When the waitress came over to take the drink orders, I decided to ask some questions and thought that might help me make the best choice. I inquired about some of the food and specific ingredients and the waitress’ knowledge of the menu appeared to be comprehensive and her ability to describe the food was impressive. After my line of questioning was complete, the waitress left and I tried to think, but nothing happened. Eventually though, something did happen and both my wife and I came up with final decisions. When the wine came to the table, we were prepared to order. I went with a starter of Seafood Salad – chickpeas, chilies, bitter greens. 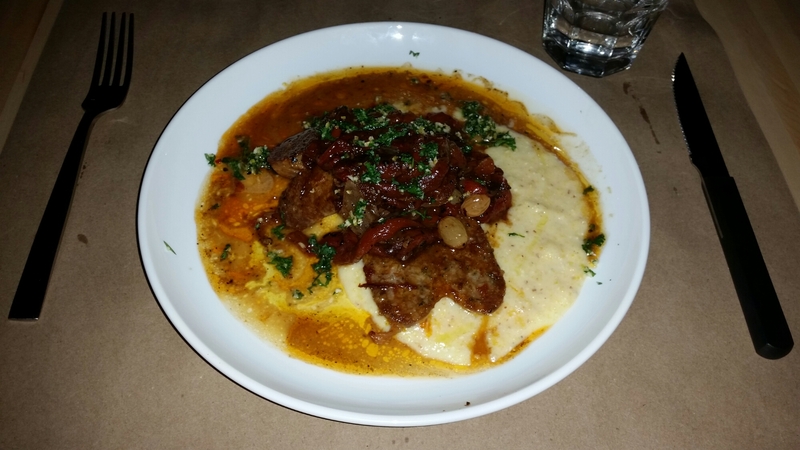 My entree was Sweet and Hot Sausages – pepperonata, polenta, golden raisins. My wife decided on the Eggplant Parm served with rigatoni and a Whole Leaf Caesar – grana, meyer lemon – and asked the waitress to hold the marinated anchovies. We impatiently waited for our meals because we went light on food consumption earlier in the day and were quite hungry. While we waited, my wife and I tried to ignore our growling stomachs by discussing all the most important things in the multiverse. Only a few minutes in, we got to crazy cat ladies wearing ugly Christmas sweaters and decided to end the conversation there because we couldn’t come up with anything more important than that. It did take a little longer than we hoped, presumably because they were so busy, but in due time, the salads came out. My wife’s Ceasar looked good, but my seafood salad didn’t look like much to me other than some lettuce and a little seafood. I figured I should dig in to see what was doing and I was surprised at what I found. My salad had practically an ocean full or mussels, octopus, and squid and it was astoundingly tasty. The dressing – some sort of vinaigrette – was potent and added a nice bite. As I got more and more into the salad, I was blown away by the seemingly never-ending seafood and how fresh it tasted. I think there was as much seafood as there were greens and I felt that the muss-octo-squid combination was absolutely perfect for a salad. No one else in town has that mix in a salad that I’m aware of, but those are some of my favorites. I got into the deep end of my dish and was very pleased. My wife’s Caesar was very good too with another solid dressing that really added a punch of flavorlishousness. We consumed while raving about the virtues of our lettuce-based plates. We finished the salads and remarked at how many people were walking in the door for an opportunity to try the restaurant. It seemed to be a constant stream of bodies, many of whom looked like they didn’t want to wait the required time for a seat which I’m sure was extensive. Our entrees came and the eggplant on my wife’s plate was circular and topped with lots of cheese and sauce. My sausages were each sliced in half and swimming in a pool of polenta on one side and a saucy puddle on the other. I think the sauce might have been part of the pepperonata which seemed to consist primarily of roasted red peppers. I first separated the halves of my sausages and then tried to pick out the hot one. I cut and then slogged a piece through the sauce and grabbed some peppers along the way. I stuffed it into my face and found that it was indeed the hot link. The heat hit me with a light jab, but not the uppercut which would have had me down for the better part of a 10-count. The sausage was quite good, but the pepperonata was really great, adding a flair that you wouldn’t necessarily get with the sausage alone. As my wife consumed her eggplant, she gave it a figurative thumbs up. I continued to eat my food and found that the sweet pork treat was actually better than what I expected – not overly sweet, but still very well seasoned. I also found that the polenta went quite well with the pepperonata and sausage both together and individually. After we finished our meals, we were at just about the right level of fullness, though we agreed to check out the dessert menu. After taking another look – it was on the original menu – we decide to pass in favor of some treats we had at home. Roustabout served us an excellent meal and is another place I found would be fun to sit at the bar if you wanted to just have a couple of drinks. The place looks great and the staff is very well schooled in their offerings. Our meal clocked in at 68 bucks before tip, so the prices were reasonable. I did think my seafood salad was a bit pricey at $13 until I actually ate it and realized that there was absolutely no skimping on the seafood. They also whipped up a sausage dish which made a favorite of mine even better. My wife and I left very happy, but as I left, I was again stuck with the question “how many damn good restaurants can Portland handle?” I think the right answer is that we’re still not there yet. This entry was posted in Portland, ME food on November 18, 2015 by peterpeterportlandeater.